I have noticed lately, that several of the researchers coming into my site have been looking for information on the Greyfriar Burials. I wanted to learn more about this topic and found an index on the ScotsFind website that might be of interest to those searching this area. 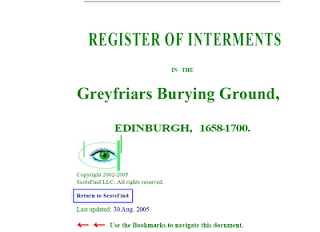 The Greyfriar Burial Grounds index covering the time period of 1658 - 1700, is in a PDF format that is organized alphabetically by surname. The site includes a map with a legend to locate the internment site in addition to the dates of internment. I would suggest reading through prefatory note prior to searching as it will explain how the author, Henry Patton has designed the document. If you would like to research this site, click on Greyfriars Burying Ground, Edinburgh 1658 - 1700. Have fun!